Hey there! Thanks for dropping by lindamariedesigns! Take a look around and grab the RSS feed to stay updated. See you around! Woo Hoo! I made it to the finals! I recently applied for a Design Team position on http://heartfeltcreations.com. And guess what? I made it to the finals. They will be sending me some stamps this week, and I will make two samples to send in to them to be judged for the finals. I’m soooo excited! I truly love their stamps and exclusive dies, and would dearly love to become a part of their team. If you go to their web site, and look at their stamps you will surely understand why! ” Here are the semi-finalists;: Dawn Lotharius, Sarah Miller, Connie Piotter, KimberlyRae Forde, Susan O’Connell, Alissa Wells, Stephanie Lee, Erika Selander, Linda Neff, Emily Neihaus, Mari Harpham, Kathleen Rooney, Deborah Cuypers, Charmagne Welch-Rivera, Rachel Dluhy, Miranda van den Bosch, Stacy Cook, Debrah Scott, Giovana Smith, Jackie Payne, Jackie Smith, Karin Zander, Cynthia Lorens Renaud, Marisa Job, Linda Selymes, Kim Nath, and Steph Ackerman. Congratulations! The semi-finalists will be recieving some HC products and then they will be creating two projects for the final round. The design team finalists will be announced on April 25. There I am, on the last line of the semi-finalists. As the quote above says, you have to vote for at least five for your vote to be counted, and if you think I would be a good addition to their design team, I would really appreciate your vote. I know I have some stiff competition; all these artists have submitted lovely work. I’ve posted below the three cards I sent them to get this far. I hope you like them! Win, lose, or draw, I’m truly honored to even be considered. But If you think I would be a good addition to the team, I could use your help. Remember, you have to vote for at least five semi-finalists for your vote to be counted. Voting occurs here. Thanks so much, and until next time, Happy Stamping! This is one of my favorite digital images to color with copics. His name is Nathan, and I’ve colored him with almost every hair color you can think of. This time I was sort of going for a natural “Lucille Ball” red, lol. The hardest part of this card for me was deciding how to display the main image on a card. I finally settled on my version of Shabby Chic. Finished Card Size: 5" x 7"
Here’s my recipe for the card. 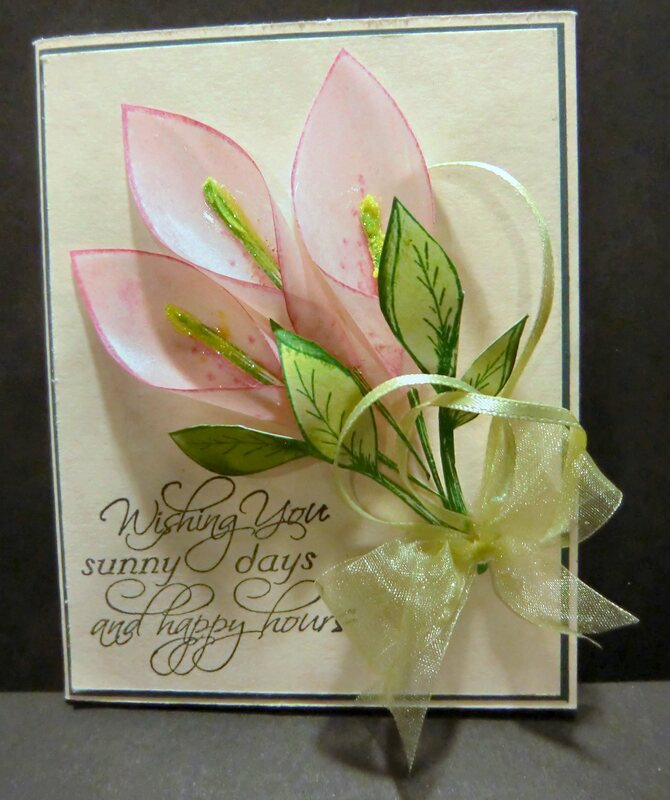 Start by printing the image on Cryogen White card stock and trim piece to about 4″ x 6″. Color image with copics. The first thing I did was to determine the light source. The shading on the original image indicates that the light source is in front of him, and slightly to the left, which would make the deepest shadows on the right side of the image. I usually start with the hair, since that will largely determine skin tones, and what color of clothing I want to use. On his hair, I used YR00, YR02, YR07, E07, and E09. I usually color from dark to light, but on this one I put the highlights in the lightest color in the center first. Then I added color from dark to light. For his skin I used E000, E02, E11, and E13, again adding color from dark to light. I colored his shirt with BG99, BG96, and BG93. The little bear is very lightly colored because I didn’t want to lose the shadows the artist had made, or her representation of fur. I used C3, C1, C00, and colorless blender on the bear. When the image was complete, I added a “glow” of BG10 BG0000, and colorless blender around the entire image. Next I took a damp paint brush and drew a wet line in sections around the image to make it easy to tear it where I wanted it. Then I distressed all the edges with Memento London Fog. Here’s where things got dicey. I must have previewed four or five papers before I hit on the “Shabby Chic” look. I then cut one piece of designer paper to 5″ x 7″ to fit the front of the card blank, a black piece to 4.25″ x 6.25″ and a different designer paper to 4″ x 6″. I didn’t think it had enough drama when I just centered those layers with the image centered on tip. So I glued them off-center on the left side and added the bling. I thought it needed something else on the lower right corner, and tried a bunch of different flowers. They just didn’t work with that little boy, and I hit on the idea of the butterfly. 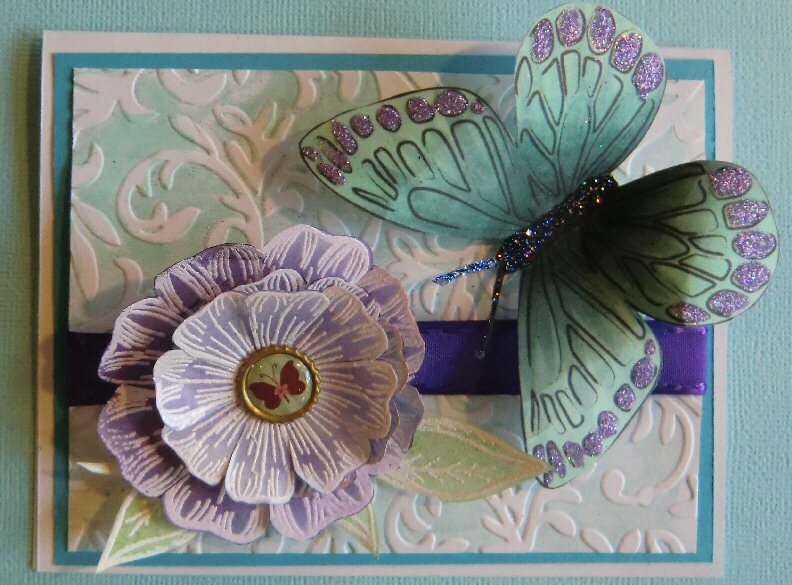 I went right to my Heartfelt Collection and got my new butterfly stamp and stamped it on a scrap of golden brown, then die cut it with the butterfly die. I distressed the butterfly with brown ink, glittered the body with brown glitter, bent the wings upward, and attached it with a pop dot to the lower right corner. I added the whole thing to the card front and took the picture. I’d love to hear what you think of Nathan. I wish I had somebody to give him to, but there are no redheaded boys in my extended family, lol. 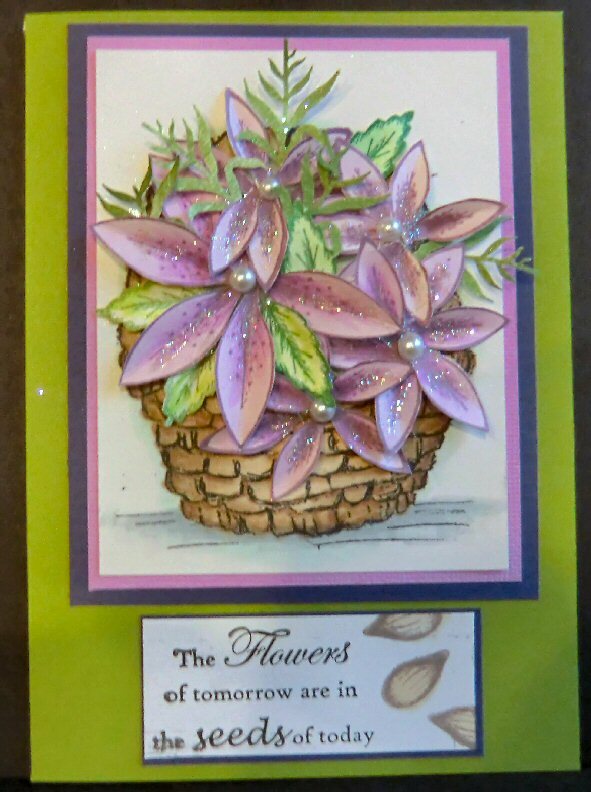 This is a card I made for a Stampers Quest blog article. For complete instructions, and an opportunity to download the basket digital stamp, go here. The stamps used are by Heartfelt Creations. Hope you like my card and my little digital basket, the first one I ever did. I used two rubber stamps by Heartfeltcreations.com; a digital butterfly stamp by just laury, a cuttlebug embossing folder, copic markers, several shades of ink, and turquoise and white card stock. 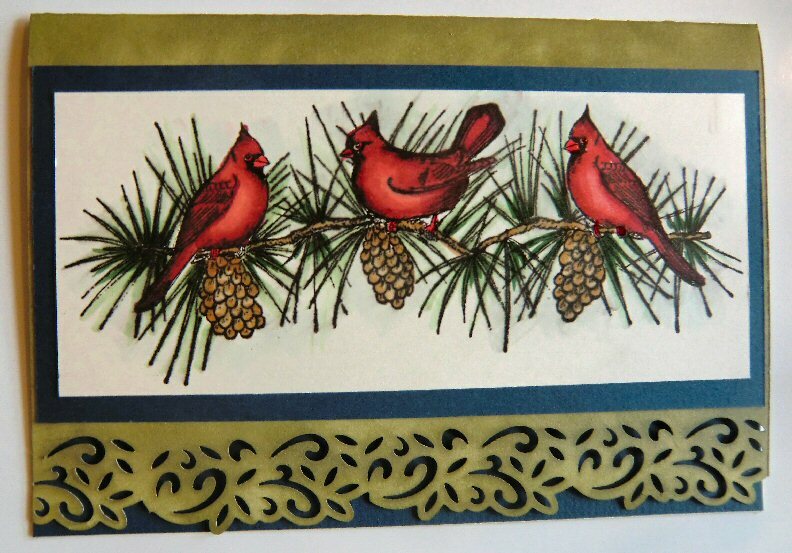 I also used two shades of glitter, and all the stamps were stamped on vellum with Versamark, embossed with White Opaque ink, cut out, and then sponged with colors of ink. The butterfly was cut out and then colored with copic markers and glittered with two colors. Sorry the details are so sketchy, but I was in a hurry because Sunday, March 18, is the deadline, and I did three cards before I found one I liked enough to enter! Of course, the good news is that if you hurry, you still have time! I don’t know if I’ll win anything or not, but I like my card. I won’t publish one I don’t like, LOL! I’d love to hear what you think of this entry. This card was actually pretty easy to make, and it gave me a chance to do two of my most favorite things — color with my Copic markers and try a new product I’ve never used before. I just got back from a stamping and scrapbooking convention in Portland, Oregon. I spent most of my money at the Heartfelt Creations booth and in their classes, but I eked out enough to buy the Marvy Uchida Quick Borders craft punch tool and all the border shapes made for it (total of 8). The bottom border on this card used one of those punches. Here’s the recipe for the card. Cut a piece of white card stock to7”x10”and run one7”side through the quick borders punch. Fold stock in half to make a7”by approximately4.75”card. Distress the front on all sides with the Spanish olive ink. Cut a piece of blue card stock to the same size as the card front, and adhere to the back side of the front for the bottom blue border. On a piece of Cryogen stock cut to2.75”x6.5”, stamp the pine cone border stamp with black ink. Color with copics markers of choice. I used R39, R37, R35, R32, G12, G24, E30 and E34. I also applied a light outline of BG0000 all the way around the image. I colored the beaks, eyes, and feet with the orange glaze pen. Adhere the image to blue card stock cut to3”x6.75”, and attach to the card front approximately centered above the bottom border. I’d love to hear what you think of my latest card. Hi Fellow Stampers! I recently found a stamp company that I absolutely fell in love with. The card above was made using their products. I’ll be displaying more of them in the near future. 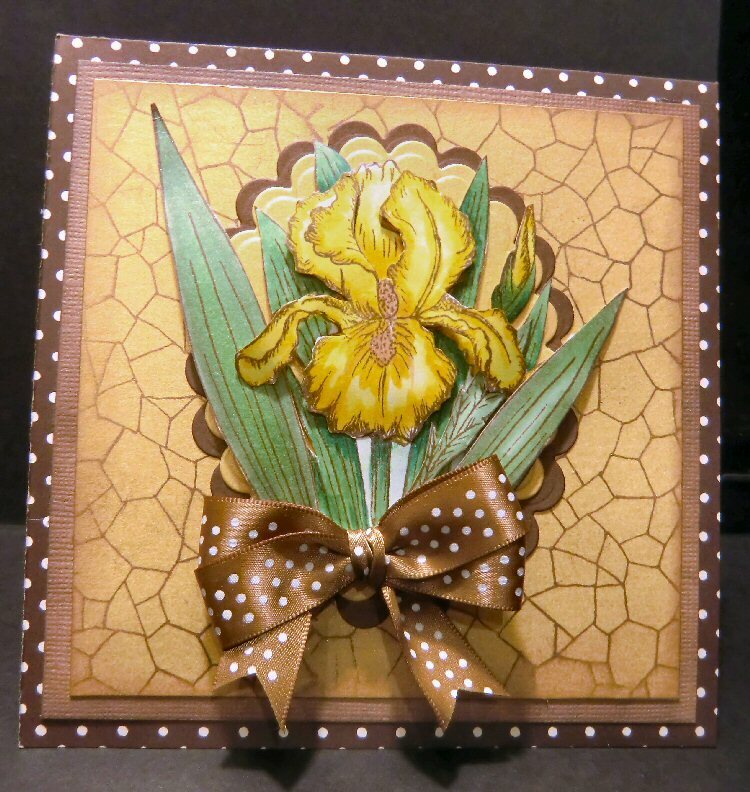 For a complete tutorial on how I made this card, and a review of the products from Heartfelt Creations that I wrote for Stamper’s Quest online magazine, go here. Here are a couple of other cards I made using their wonderful designs. 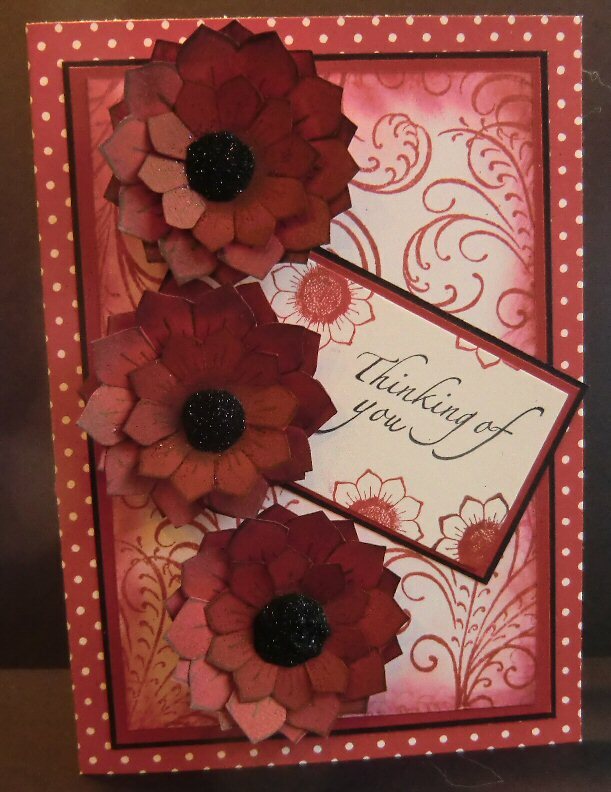 All of these cards feature designs by Heartfelt Creations. I hope you enjoy looking at them as much as I enjoyed creating them. Tutorial for the Regal in Red card can be found here. Hi cyber friends. I’m delinquent in posting anything new. I’ve been so busy over at http://www.stampersquest.com with my new duties as editor, I have to scramble to find time to post here. I’m teaching a Stampscapes class in September, so I thought I’d share some of what I’ve been doing. 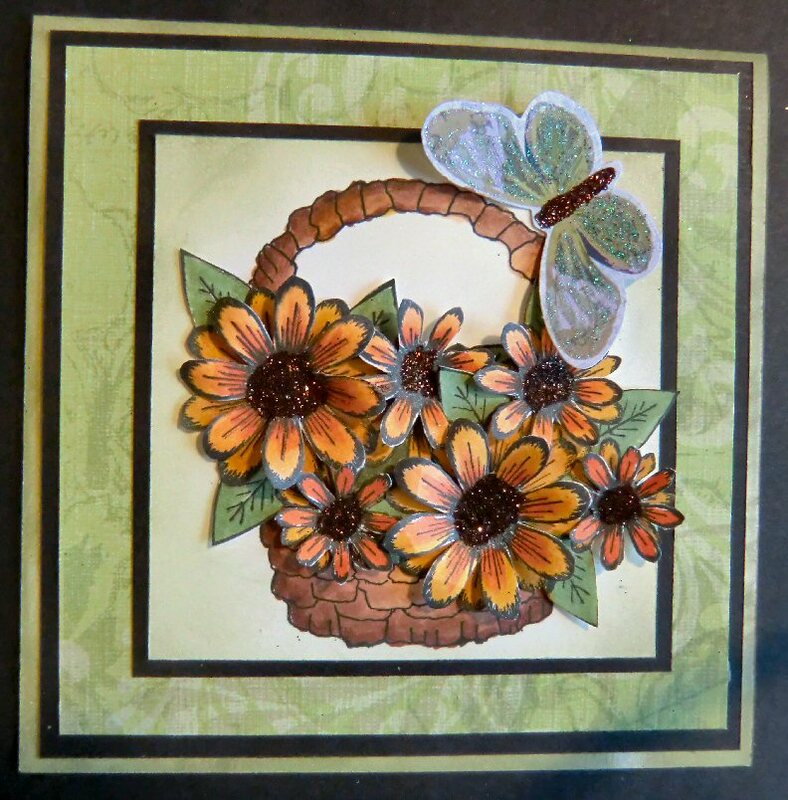 This is a scene I thought I might use in the class, but decided it might be too difficult for a beginner class, so I’ll be showing it in class as an example of how to use just parts of a stamp to create a different scene. The autumn bank stamps are usually used to depict a large body of water in front, like a lake, and I wanted to create banks on both sides of the water to simulate a wide river, like maybe the Columbia River in Washington State, where I live. Here’s how I did it. I used glossy paper, cut to 4.75″ x 6.75. Two Marvy brush markers were used to color the stamps; No. 56 dull blue for the clouds, and No. 27 olive-brown for everything else. 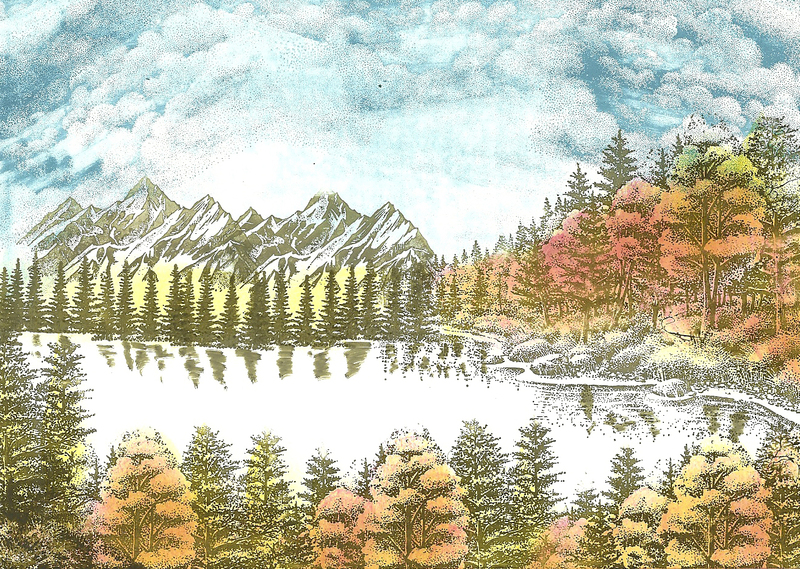 I started by stamping the autumn bank on the right side, in about the middle of the glossy paper, then the mountains twice just to the left and slightly above the bank. Then I stamped fir row repeatedly starting just below the mountains, varying the height each time slightly until I ran off the page. I think it was five times. This picture doesn’t show the white card stock at the bottom, but it’s there. For the bottom half of the scene I stamped autumn bank partially, three times across the sheet, working from right to left. 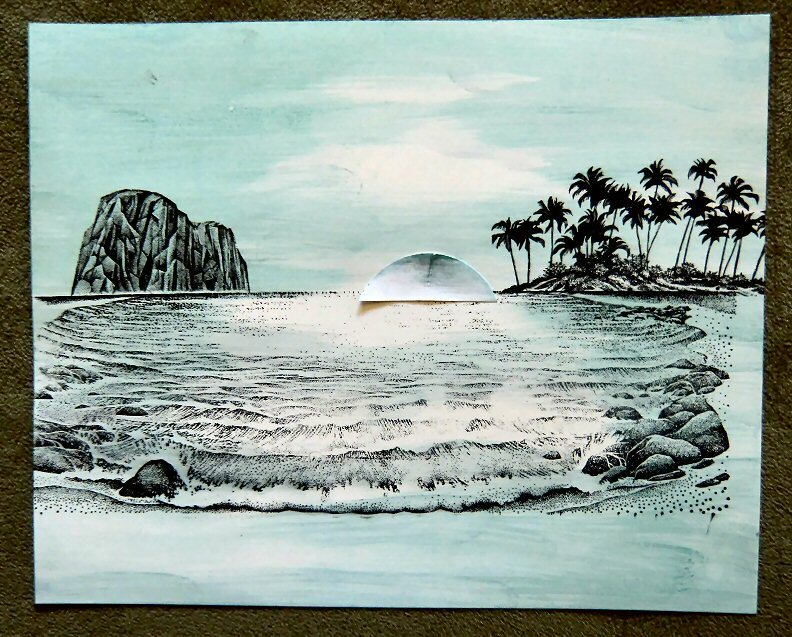 I only used the part of the right hand side of the stamp, leaving off the cove and all water. 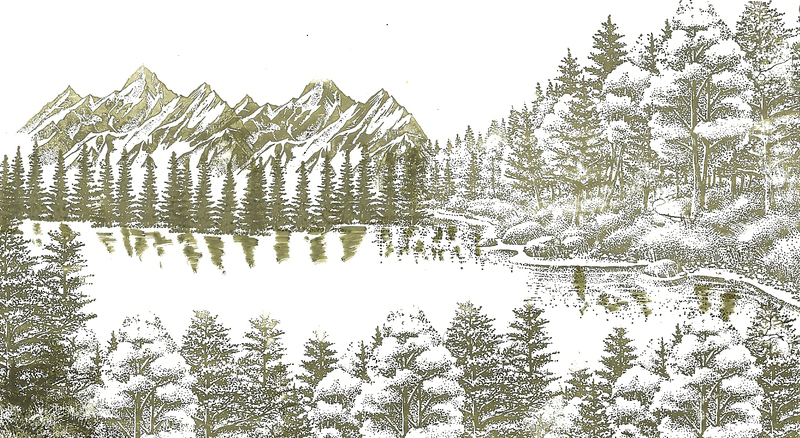 I also used the olive-brown marker to scribble in some reflections below the fir trees. I wasn’t happy with how prominent they were, but I’ll show you later how I fixed that. For the sky, I inked up the cloud stamp, and stamped several times from left to right before reinking, randomly across the top. I repeated this process from right to left. I wanted much lighter color in the center of the scene. 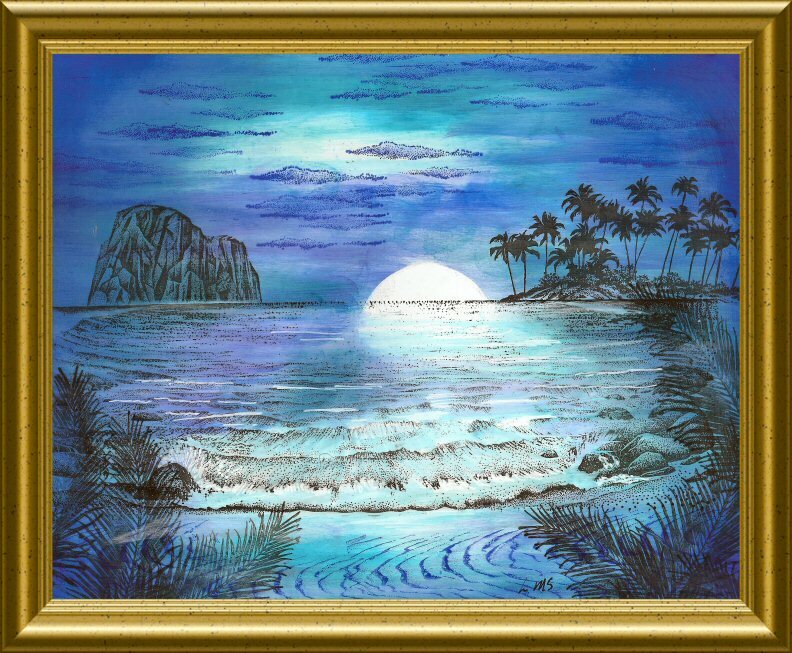 To color the scene, I used Memento dye ink pads and sponged in color using a Colorbox stylus and tips, changing tips each time I changed colors. 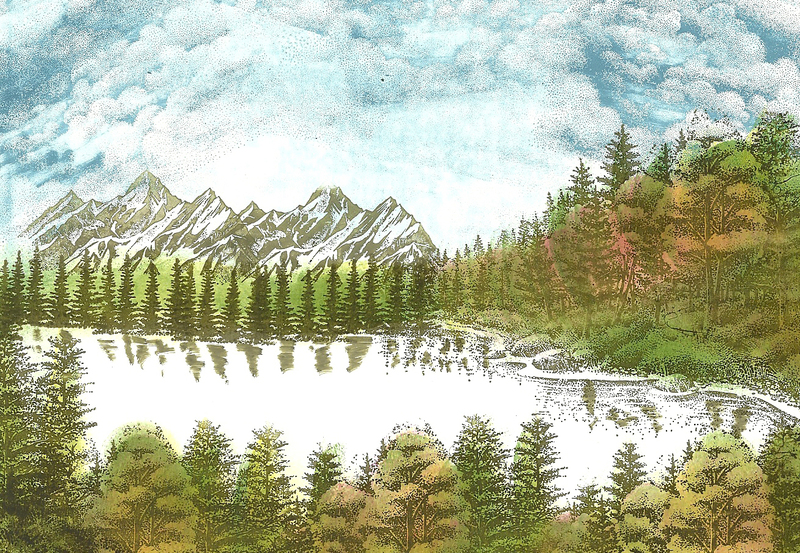 I started on the foliage, which represents the largest part of the scene. I wanted to create an autumn look, so I first sponged Dandelion over most of the foliage, being careful not to get it in the sky or water area, since yellow and blue make green. I wanted some orange, and didn’t have an orange pad, so I sponged in a very light layer of pink (Rose Bud) over parts of the foliage, particularly in the areas where the trees were deciduous. Rose Bud is a very bright pink, so I sponged off on scratch paper until the stylus tip was almost dry before I sponged the scene. Then I sponged in Bamboo Leaves) again sponging on scrap paper first in some of the areas. I wanted several shades of green, and to tone down the orange a bit. Now it was time to sponge in my sky and water, the mountains and a few rocks. 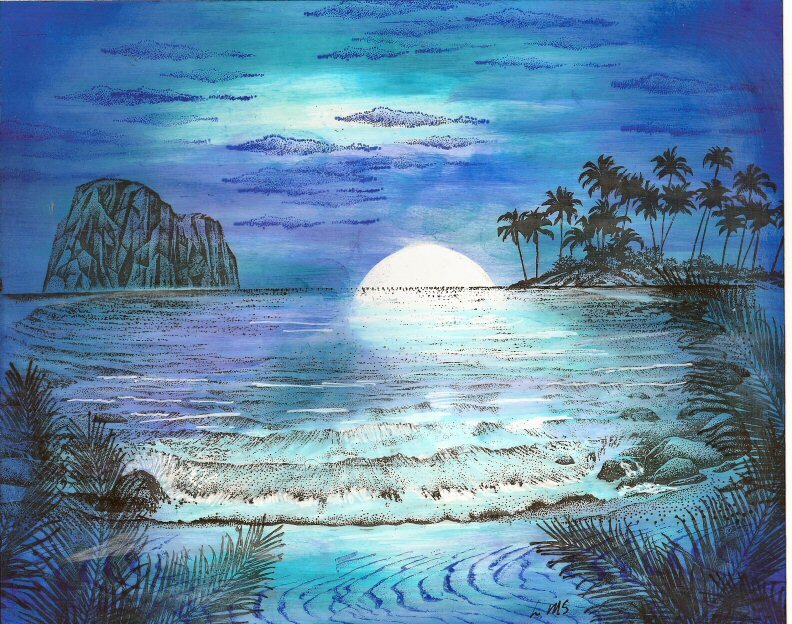 I used Summer Sky and Bahama Blue on both the sky and water, plus a little bit of a dark blue (Danube Blue) just in the top corners of the scene. The mountains and rocks were sponged with London Fog, a dull gray. 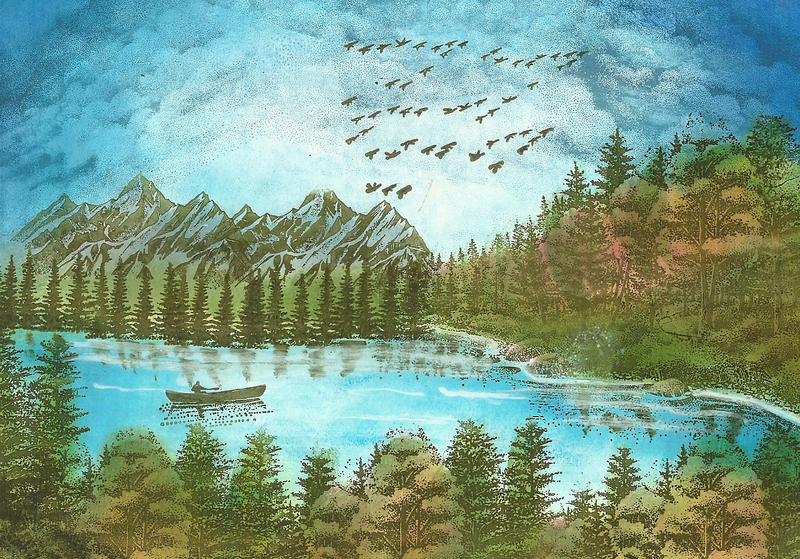 All I needed to do was ink up the migrating birds, the solo canoeist and call it done. 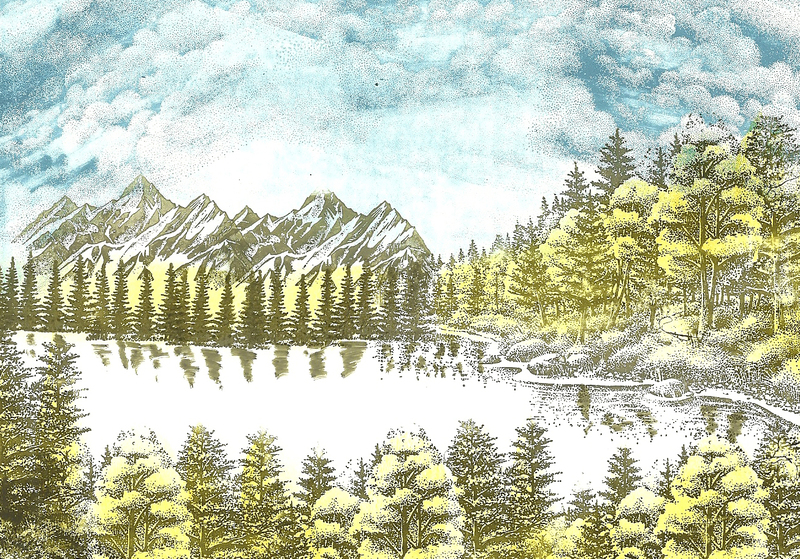 However, remember I didn’t like the way I added in the reflections of the trees. They were way too stark. 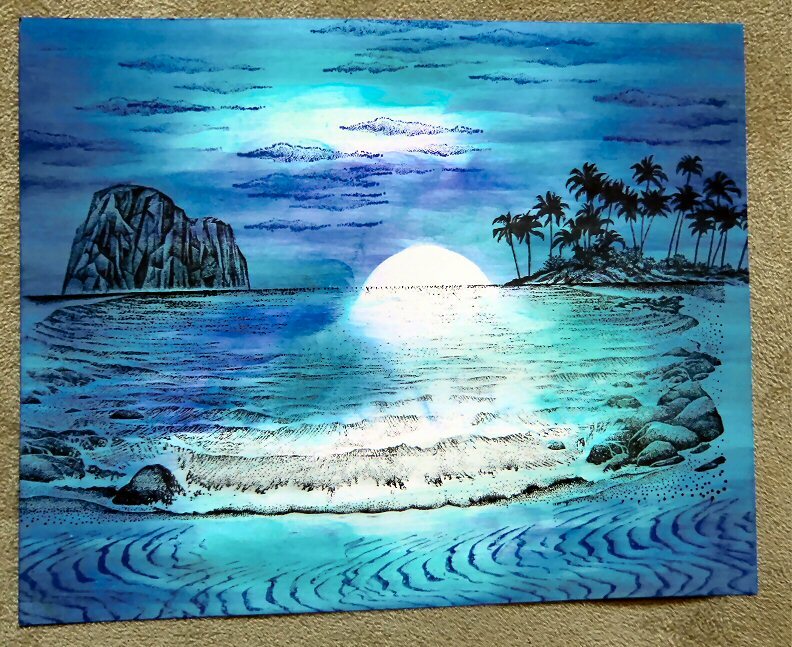 So I took an opaque white poster paint marker from Sharpie, and scribbled in some lines across the trees, around the shoreline, and a few other places in the water for consistency. This tended to break up the lines, make it softer, and more like a reflection. (Whew!) I almost never give up on a scene when there’s something I don’t like. With Stampscapes stamps there is almost always some way to fix your boo boos! Now the scene is finished, ready to mount and make into a card. One of the reasons I used Memento Inks, even though I don’t have all the colors, is that I read in one of Kevin Nakagawa’s articles that they are fade resistant. I usually spray Krylon Clear Gloss heavily on my dye based inked scenes, and I want to see what will happen if I don’t spray this scene. I’ve made a color copy on high quality photo paper to compare the two in a month or so, and I will have learned something new to share with my class. I hope you have enjoyed this little tutorial and would love to hear your comments. I recently participated in a swap at an online yahoo group. The group is focused on stampscapes stamps, and the theme for this swap was “Out of This World”. Here is the swap I sent. Since my partner (who lives in Australia, BTW) has received it, I can now share it. I didn’t do step by step photos of what I did, but I will tell you what I remember about how I did it. 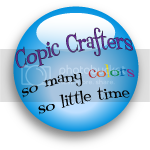 It features both stampscapes stamps; found here; and digital stamps from Stitchy Bear Digital Stamps, found here. 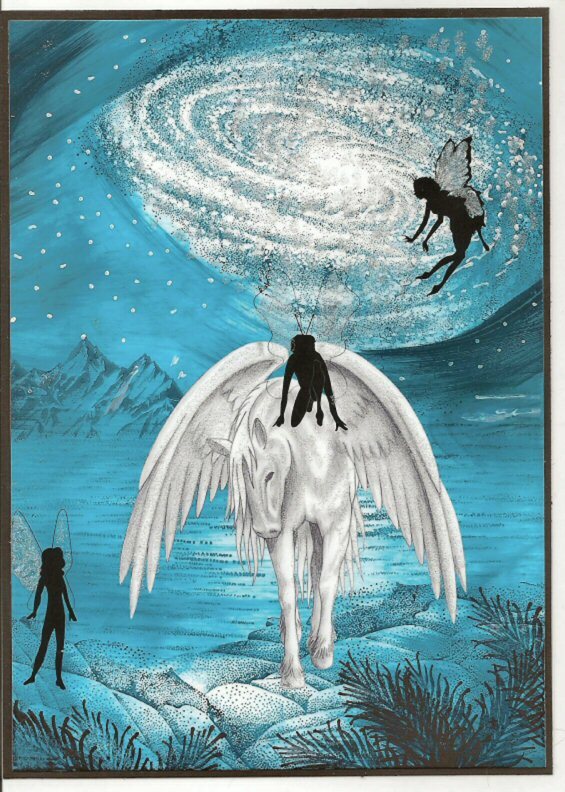 The Pegasus, and the three fairies are from Stitchy Bear Digital Stamps, and are by several artists, floppy lattes digital designs, and delicious doodles; but all can be found at the link above. The rest of the stamps are all from stampscapes.com. 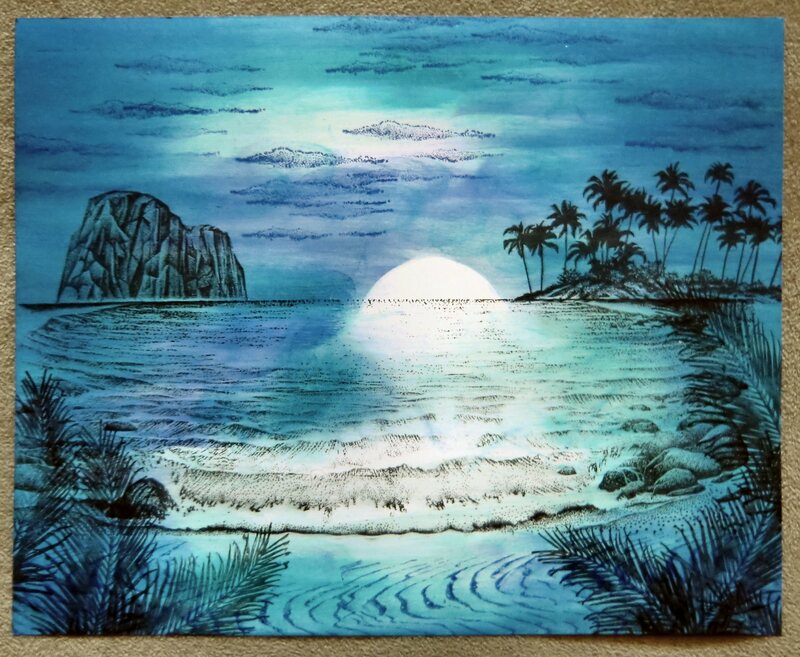 If you like scenic stamping, and think you would like to belong to a group that is made of many talented artists, and IF you are willing to participate, post your art, and maybe get involved in swaps, go to http://groups.yahoo.com/group/StampscapesII/, and apply. They are a wonderful group of artists, and I’ve learned sooooo much from them. I haven’t had much time to play with my Stampscapes stamps lately.This morning I decided, that’s enough, I’m going to do a scene before I do any of the other things I’m supposed to be doing! This is the result. I thought I would actually write up a tutorial on how I did this using a technique I learned from Kevin Nakagawa, owner of Stampscapes.com So here goes. Cut a full sheet of card stock to 8″ x 10″ and stamp the three main stamps in the black ink. When the ink is dry, (you can speed up the process with a heat tool) add the half circle mask to represent the moon along the horizon line. Pour a little bit of the Aqua Re-inker ink into the lid of your Aqua ink pad. Using a stylus tool and a clean tip, streak ink onto the scene starting at the outside of each side, toward the middle. Repeat from the other side, leaving white streaks here and there, particularly in the middle. Still using the stylus, add Pool, Stonewashed, Stream, and Violet inks in that order. Always start outside the edge and work your way in towards the middle, and don’t cover all the ink of each preceding layer when you change colors. You want some streaks of each color in your scene. Ink cloud strips stamp with violet ink and stamp as desired across the sky. Ink sand pattern with violet ink and stamp as desired in the foreground. 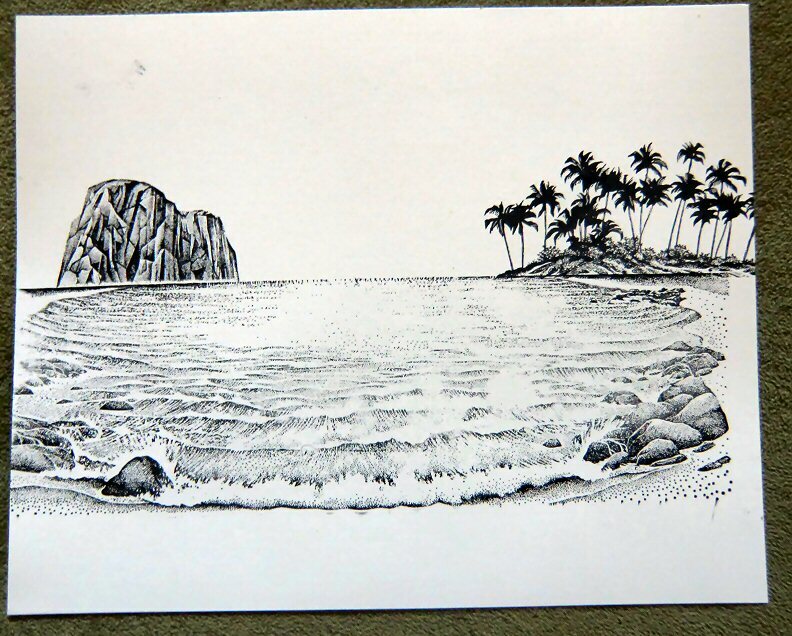 Ink the frond stamp with black ink and stamp several times, turning it each time, at the bottom left and right of the scene. It is not necessary to have the whole stamp in the scene each time. Now it’s time to go back and fix anything that you don’t like in the scene, and add some final colors in small places. If you go back to a lighter color of ink be sure to use a clean stylus tip. I colored small areas of the sky and clouds with Tombow Marker No. 623. I darkened each of the corners with the violet ink, and added some pale blue to some parts of the waves with Tombow Marker No. 451. Then using the sharpie paint pen, I added some foam lines, splashes, and a very few white dots to the leaves of the frond to represent water drops. At this point I called it “done”, and put my initials on my art. All that’s left now is to spray it heavily with the krylon spray. This is necessary because many of these inks will fade quickly if they aren’t “fixed” to the card stock. Now you can frame it and hang it in your studio, or give it to a friend you know will appreciate it. I hope you found this tutorial useful and, if you have any stampscapes stamps, will try this technique of coloring with inks. I’d love to hear your comments. 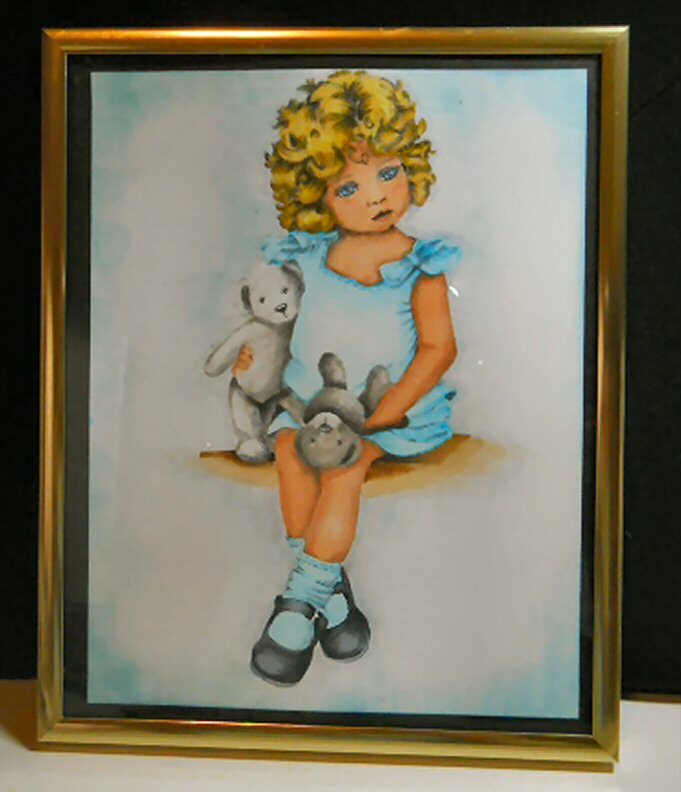 This cute little girl is a Sugar Nellie digital stamp called “Sybil” that I found at the funky kits web site. Isn’t she just adorable? 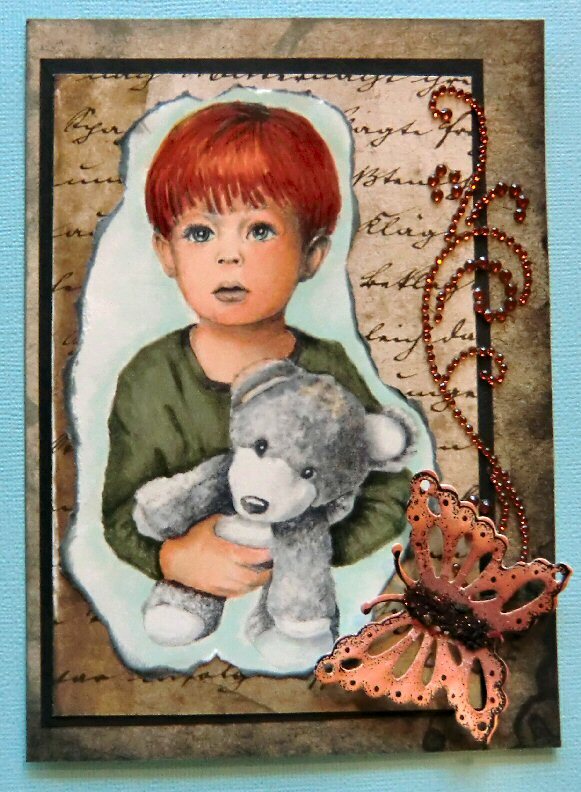 Sugar Nellie makes some of the most realistic digital stamps I have seen anywhere. I printed her out as an 8″ x 10″ on Neenah Classic Crest, and colored her with Copics, then put her in a frame. I forgot to sign her, but will do that before I give her away. The technique I used was to create a pastel look using the colorless blender for an advanced class I’m taking from Suzanne Dean at Color Me Creative. I used this technique on her dress, socks, and the bears. 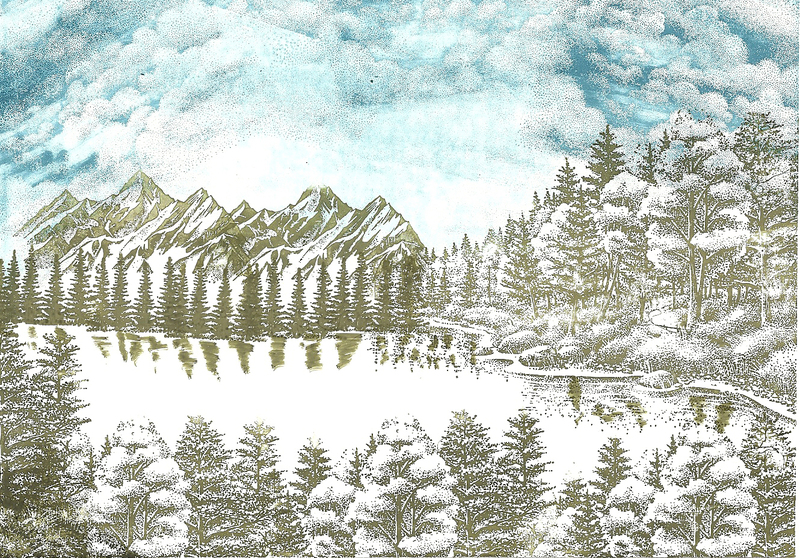 The pale blue background is Adirondack Aqua Dye Ink, sponged on with a Colorbox stylus. I would love to hear any comments you might have. Until next time, Happy Coloring.